On Sunday, Paralympic athlete Tatyana McFadden – nicknamed 'The Beast' -- will compete in the New York City marathon. She has already won three marathons this year alone, and if she wins this one, it will be something no runner has ever done. NBC's Kate Snow reports. If wheelchair racer Tatyana McFadden is the first to roll across the finish line at the New York City Marathon on Sunday, she'll be the only person ever to win four major competitions in a year. But even before she uses her incredible upper body strength to propel herself across the Verrazano-Narrows Bridge and past 26.2 miles of cheering crowds, the 24-year-old para-athlete has already set her sights on another prize: gold at Sochi. McFadden, nicknamed "The Beast" by her coach, is hoping to qualify for the U.S. Nordic skiing team competing at the 2014 Winter Paralympics — and use the platform to send a message to Russian President Vladimir Putin that his ban on adoptions by Americans is wrong-headed. NBC's Kate Snow spoke with Tatyana McFadden, an extraordinary athlete and passionate advocate for Russian adoption. For her, it's a personal cause. McFadden was born in St. Petersburg, Russia, with spina bifida — essentially a hole in her vertebra — and spent her first years in a grim, crowded Russian orphanage. She filled up on cabbage soup, learned to walk on her hands because there was no money for a wheelchair, and vied with 70 other children for the attention of two caretakers. "Any tough day that I have now, I have to think about, 'I've been through tougher. This is going to be a breeze,'" she told NBC News. "I think it sort of gave me the determination, the will and the drive...knowing sort of what it feels like to suffer." McFadden might have spent the rest of her childhood in the orphanage — she was not expected to live past 10 without proper medical care — if an American woman who worked on disability policy for the federal government had not visited on a business trip. Debbie McFadden felt an instant connection with the determined little girl, adopted her and brought her to the United States, where Tatyana began to thrive physically and emotionally. She channeled her considerable energy into athletics, winning a legal challenge in high school that led to the nation’s first law allowing students with disabilities to be part of their school sports teams. "I did table tennis, field, ice hockey, downhill skiing and swimming and finally, I tried racing. And I knew that racing was the best fit for me," Tatyana said. Hard to argue with that given her 10 track-and-field medals from three Summer Paralympic Games, not to mention back-to-back wins from the Boston, London and Chicago marathons — a trifecta never achieved by anyone, disabled or not. "She averages about 16 miles an hour so she's doing under a 4-minute mile for 26 miles," said her racing coach, Adam Bleakney. "If she wins in New York City this weekend, it'll set a precedent and set a standard for everyone else to shoot for," he said. "It's not been done before, and the fact that she's able to do it really speaks to her versatility and her skill and her talent." But a grand-slam win on Sunday would merely cement her standing in wheelchair racing, and McFadden is anxious to conquer new challenges. Her latest obsession is cross-country skiing. Her debut performance in January at the World Cup made her eligible for Sochi and as soon as the New York City Marathon is over, she'll start training in earnest for several other races that would help her secure a spot on the team to compete in Sochi next February. She's currently the top-ranked U.S. woman in her category. The Winter Games have been buffeted by controversy over Russia's new anti-gay "propaganda" law, but McFadden has a different bone to pick with Putin. Last year, after Putin signed a bill barring Americans from adopting Russian children — in retaliation for a U.S. crackdown on human rights abuses — McFadden showed up at the Russian embassy in Washington, D.C., to protest. "You can't use children as pawns between two political viewpoints. It's not right at all," she said. While the Russian embassy accepted a petition she delivered, the demonstration didn't make much of a splash. So McFadden says the chance to make some noise in Sochi on the cross-country course will be an "added bonus" -- and a reminder of how one U.S.-Russian adoption turned out. "I think going back to Russia and competing at the Sochi Winter Games, it's definitely going to show that I am a living success story," she said. But first things first -- before she hits the snow, there's another marathon to run. She won Chicago by just three seconds, but if McFadden is worried about New York, she's not showing it. "It's gonna be a fun weekend," she said. "It's gonna be very competitive." And whatever happens Sunday, whatever happens in Sochi, McFadden will remain a force to be reckoned with in the world of wheelchair racing. Asked how he feels about her new Olympic dream, Bleakney recalled the advice he gave his star athlete. "I told her don't get injured," he said, "because we have the Boston Marathon in April." 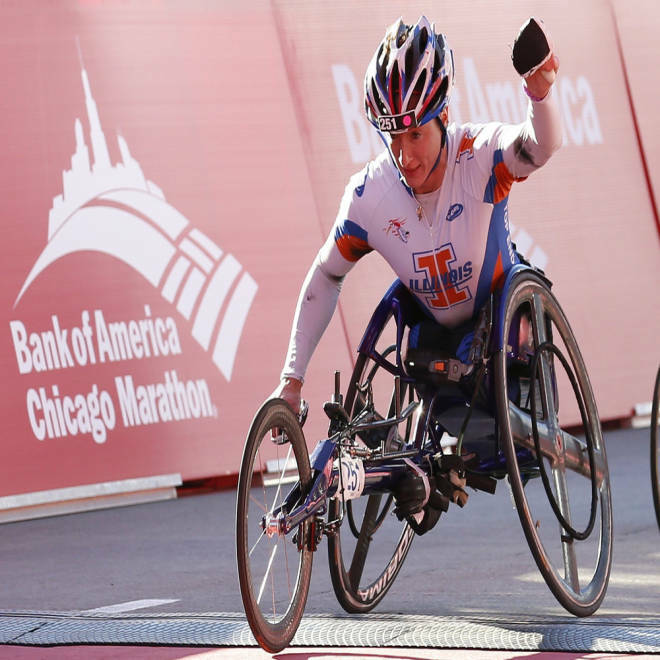 Tatyana McFadden wins the women's wheelchair division in the Chicago Marathon on Oct. 13, 2013.